A number of Christian organisations are gathering in Central London this afternoon to protest against human rights abuses in Eritrea. The East African nation has one of the most repressive governments on earth and produces many of the world's refugees, according to Christian Solidarity Worldwide (CSW). It reports tens of thousands of people from different faith groups have been detained without trial or change, often kept in shipping containers and other makeshift facilities or in open desert pens. 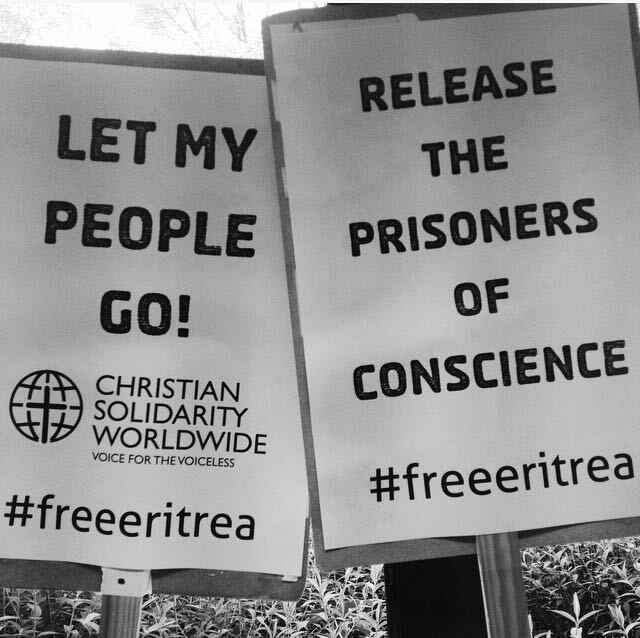 CSW is being joined by Human Rights Concern Eritrea, Release Eritrea, the Evangelical Alliance, Church in Chains and the British Orthodox Church at a demonstration vigil outside the Eritrean Embassy in the Angel area of London. Organisers say the event, being staged between 3.30pm and 4.15pm, coincides with the 14th anniversity since severe restrictions were imposed on churches in Eritrea. A statement on the CSW website said: "Join us ...to let the world know we haven't forgotten about Eritrea." Christian Solidarity Worldwide is a Christian organisation working for religious freedom through advocacy and human rights, in the pursuit of justice. You can find out more about Christianity in Eritrea by watching the video below.